Ethical Issues and Citizen Rights… | Tim Bagwell, SMC, Ph.D.
Robert A. Cropf (Saint Louis University, USA) and Timothy C. Bagwell (Walden University, USA). 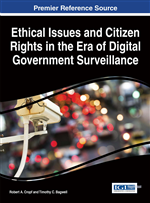 Ethical Issues and Citizen Rights in the Era of Digital Government Surveillance focuses on the risks presented by the usage of surveillance technology in the virtual public sphere and how such practices have called for a re-examination of what limits should be imposed. Highlighting international perspectives and theoretical frameworks relating to privacy concerns, this book is a pivotal reference source for researchers, professionals, and upper-level students within the e-governance realm. Questions surrounding the concept of freedom versus security have intensified in recent years due to the rise of new technologies. The increased governmental use of technology for data collection now poses a threat to citizens’ privacy and is drawing new ethical concerns.